It’s kind of weird realizing I have not yet done a macaroni and cheese recipe. Not that I’m making it in secret and holding out on you guys or anything. It’s just so delicious and pretty easy to make from scratch with just a little bit of attention. For the base of this recipe, I found a pretty basic one that starts with a roux (or bechamel, once you add the milk). I believe I got this one from the Pioneer Woman. 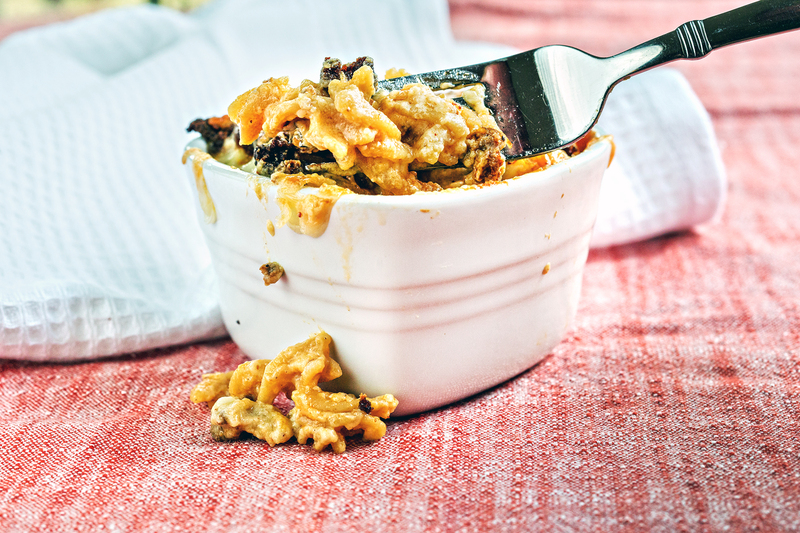 Clearly, you can add anything you like to this macaroni and cheese recipe. The nice thing about using chorizo is that it kind of does all the work for you. You don’t really need to add a lot of pepper or spices or anything since the chorizo is already seasoned. For the cheese, if I was doing plain mac ‘n cheese I would probably use all sharp cheddar. However, I’m a big fan of asiago with chorizo. There’s something about the creamy nuttiness that cuts through the spice blend. I did half and half asiago and monterey jack, but you can use anything really melty. A Mexican melting cheese would work wonders in this recipe. I would have used queso quesadilla or asadero but alas, my Sprouts has a pretty limited selection of Mexican cheeses. Elbow macaroni is the traditional choice of noodle, but anything that will collect and hold the cheese will work. I actually used a chickpea fusilli. One of the nice things to come out of this whole gluten-free phenomenon is the invention of new pasta. This recipe is obviously not gluten-free since it starts with flour and butter. However, legume-based pastas are a powerhouse of protein and fiber. The chickpea pasta boasts 11 grams of protein and 5 grams of fiber, and this one is lower on the protein/fiber than most I’ve seen. While I wouldn’t use it for anything plain like buttered pasta, with a hearty sauce (or completely coated in cheese), it’s a pretty good stand in for something a little healthier. You don’t even have to tell your kids it’s really beans. Cook the noodles until very al dente. The noodles should be too chewy to eat straight from the pot. Drain and set aside. In a skillet over medium-high heat, brown the chorzio. Set aside. In a large pot or dutch oven, melt the butter and sprinkle in the flour. Whisk together over medium-low heat. Continue to cook the mixture until it starts to turn brown, about 8 minutes. Don't let it burn! Take 1/4 cup of the sauce and slowly pour it into the beaten egg, whisking constantly to temper the eggs. Pour the egg and milk mixture back into sauce, whisking constantly. Stir until smooth. Add in all but about 1 cup of the cheese and stir until it melts. Add salt and pepper to taste. Keep in mind the chorizo will be salty and seasoned already! Pour in the cooked noodles with the chorizo and stir to combine. 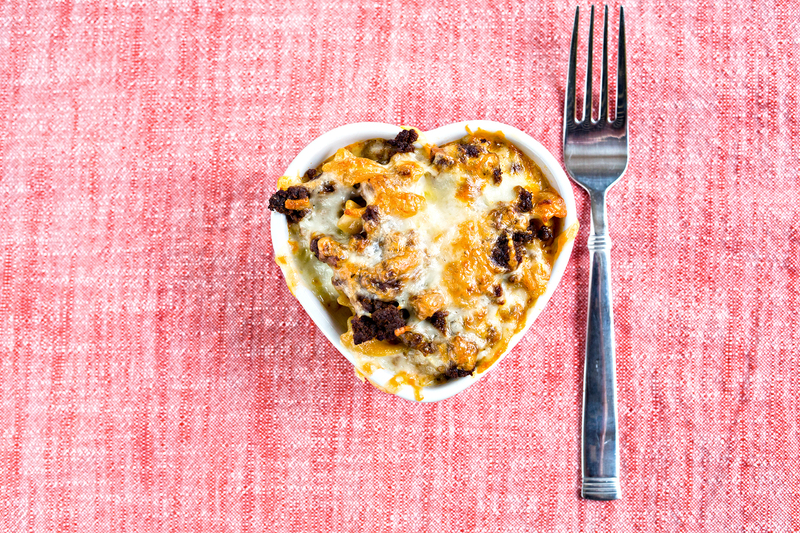 Serve immediately (very creamor pour into a buttered baking dish, top with extra cheese, and bake for 20 to 25 minutes or until bubbly and golden on top.